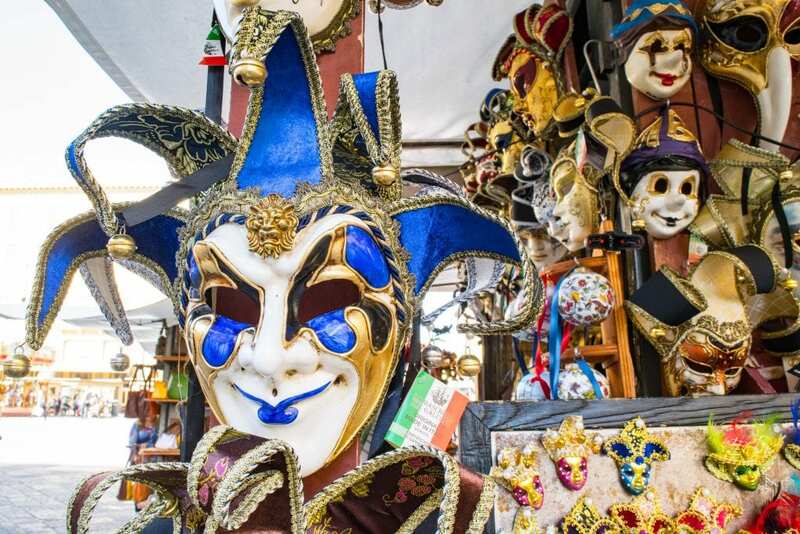 Florence or Rome: it’s hard to imagine a harder choice to make when putting together an itinerary for a trip to Italy. 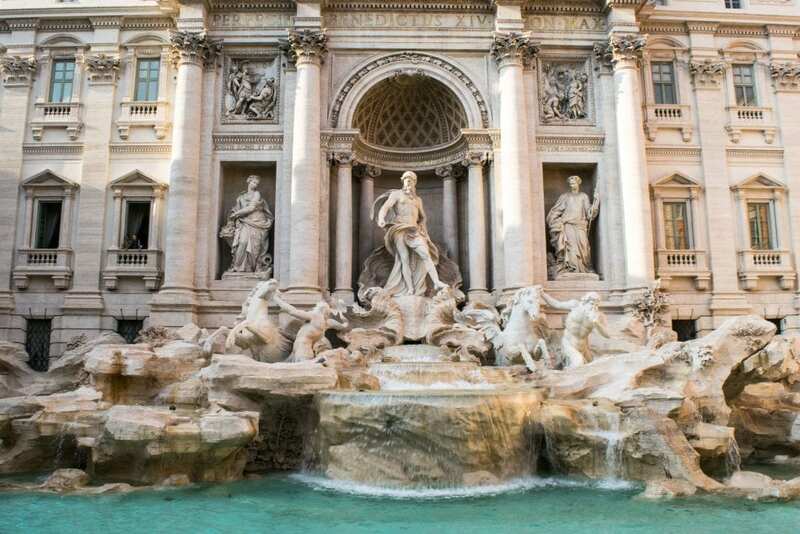 Each city boasts some of the most magnificent things that Italy has to offer, from artistic masterpieces like the statue of David to world-class archeological sites like the Colosseum. While we would (obviously) recommend squeezing in visits to both the Eternal City and the Cradle of the Renaissance (yes, Italian cities have epic nicknames) if you can, if your Italy trip simply doesn’t have room for both, here are some similarities and differences to help you decide between Florence and Rome. Is it possible to take a day trip from Rome to Florence (or vice versa)? … You want to visit a walkable city. 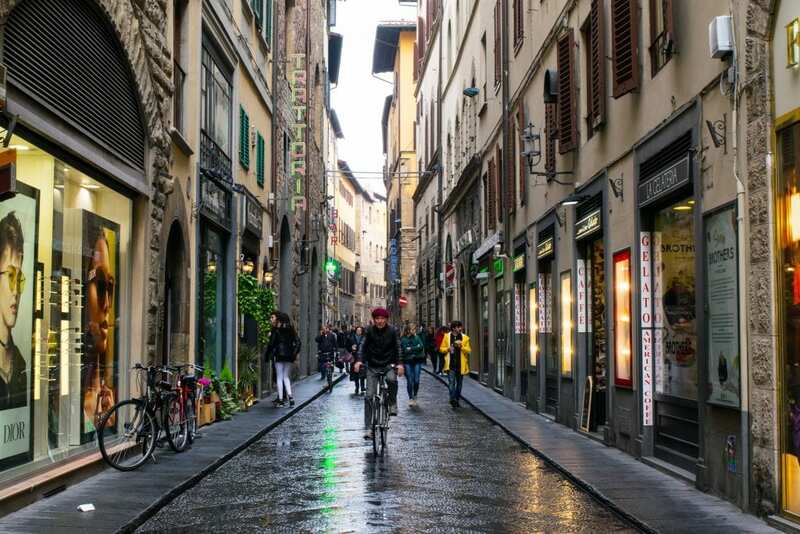 While Rome is an enormous, sprawling metropolis, Florence is a much smaller city geographically: with the exception of heading out on day trips to the Tuscan countryside, you likely won’t need any transportation other than your own two feet while here! … You want to see the city of the Renaissance. This is the city of Dante, of Michelangelo, of da Vinci. It’s where you can admire the masterpiece that is David, where you can marvel at the work of Botticelli in the Uffizi Gallery, where you can see the grave of Galileo where it sits in the Santa Croce Church. If the Renaissance period interests you, it’s hard to imagine a better destination than Florence. Want to avoid long lines at the Uffizi? Plan ahead! … The smaller Tuscan villages call your name. 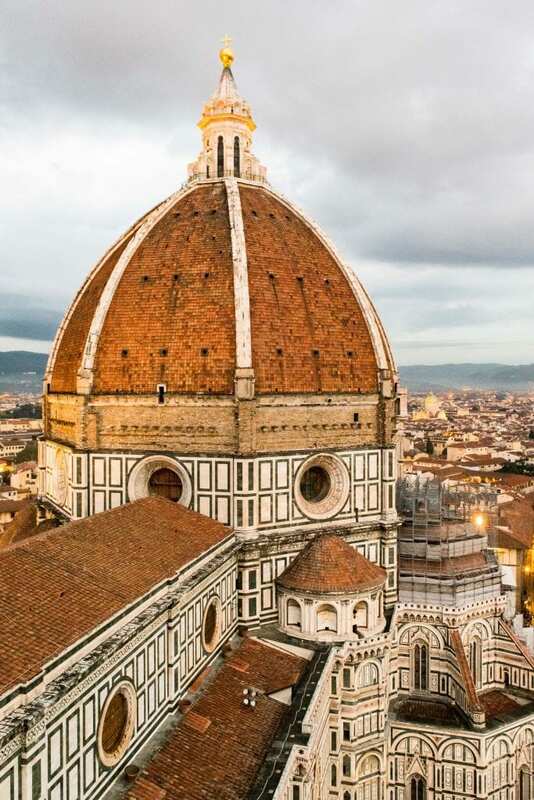 Florence is a city that makes it very easy to schedule day trips: Florence’s main train station is about a 15-minute walk from the Duomo, and the station connects with Tuscan cities like Lucca, Siena, and Arezzo. 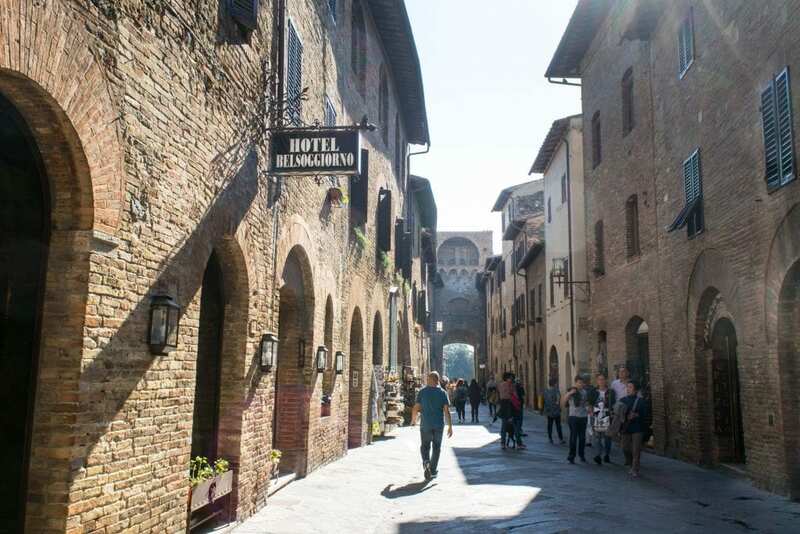 With a car, you can reach even smaller villages: we personally loved nearby San Gimignano. … Food is a focus of your trip. Look, here’s the bottom line: there’s no such thing as somewhere in Italy that has bad food (though food does vary by region–don’t except epic Napoli pizza in Venice)… but Tuscan food is something special. Delicious, varied, and accessible, Tuscan cuisine is addictive and delicious. 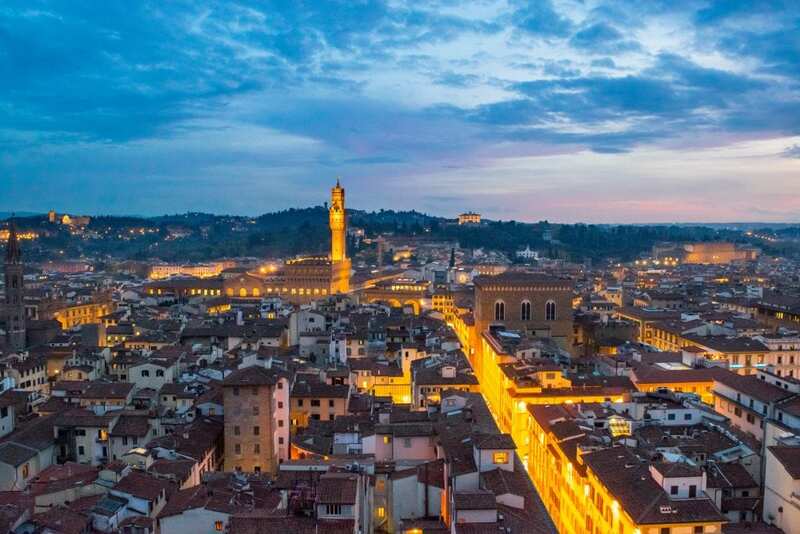 In Florence, you’ll find scrumptious pasta, some of the best gelato in the world (it was invented in Florence), tasty Florentine steak, lovely pappa al pomodoro, incredible truffles, wonderful Tuscan wine (especially our favorite, the Chianti Classico), and so much more. To sum up Florence: A trip here will likely focus on food, Renaissance art, walkable highlights, and visits to the Tuscan countryside. Both of these Florence hotels are midrange in price, boast an excellent, walkable location, and have wonderful reviews–we wouldn’t hesitate to stay in either one! If you’re in Florence for an extended visit, we loved the small but perfectly located Airbnb Apartment in the Heart of Florence (Never used Airbnb before? Sign up with our link for a discount on your first stay! ), but we tend to prefer hotels for shorter stays these days. … The history of the Roman empire is a major draw to you. 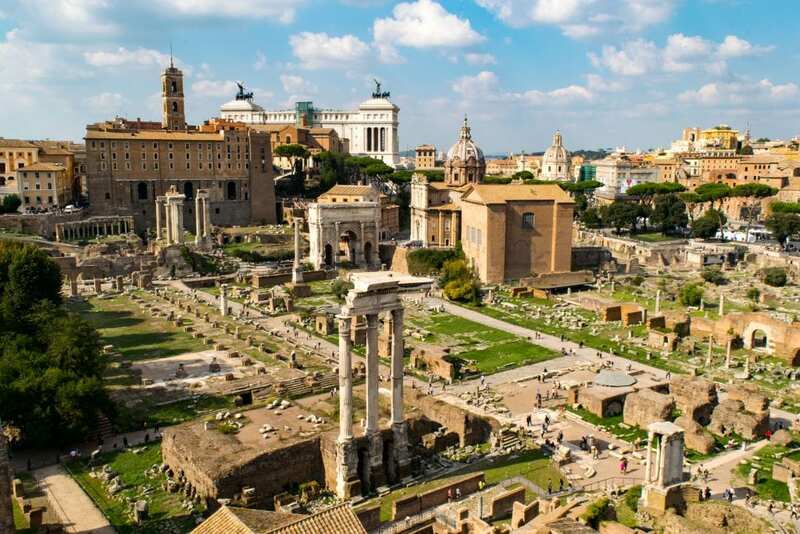 Have you always wanted to bask in the glory of the Colosseum, to wander through the Roman Forum and see if you can squint and imagine life 2000 years ago, or to theorize at how the Pantheon was built while staring up at it in person? If so, then Rome is the city for you (and some of the historical sights are free in Rome, too!). 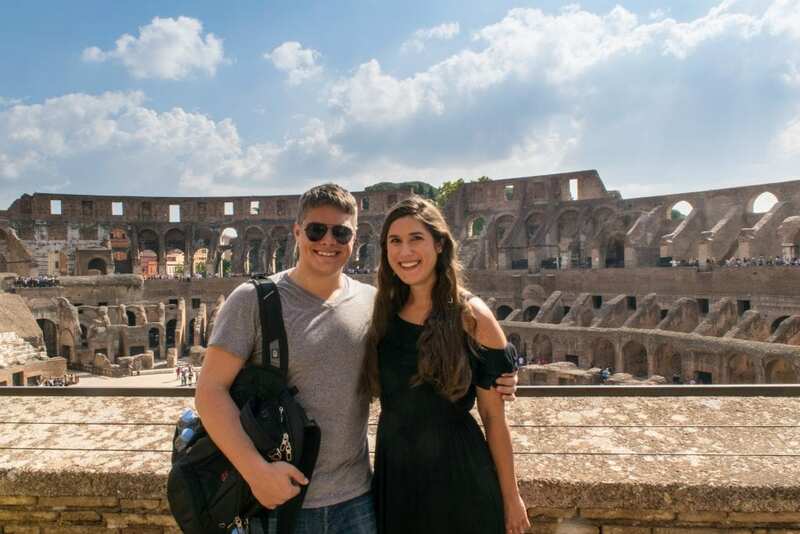 I’ll never forget laying eyes on the Colosseum for the first time–even knowing we were on our way to see it, the sheer majesty of it, combined with the fact that it is such an iconic, world-class site, caused my breath to catch in my throat. Save time & skip the line at major Roman Empire attractions during your trip to Rome! … You’ve always wanted to see the Vatican. Whether you’re Catholic or not, there’s something about Vatican City that draws you in: as the smallest country in the world, it’s impossible not to marvel at the sheer amount of power that has come from this small city-within-a-city. From St. Peter’s Basilica to the Vatican Museums and, of course, the iconic Sistine Chapel, there is something very special about exploring Vatican City. If you’re so inclined, the Pope gives public addresses on Wednesday mornings when he is in town, and also appears on Sundays at noon when he is in Rome. Luckily, the Vatican is also not a season-specific activity–whether you’re visiting Rome in the winter or the summer, the Vatican will look just the same! The line to enter the Vatican Museums can easily be hours long–it was when we visited, even though it was shoulder season. Save time and plan ahead! … You want to enjoy a large city. Far from a quaint Italian village, exploring the best of Rome will likely mean using both the metro and bus systems to get around. Major sites, like the Colosseum and the Vatican, are not within walking distance of each other, so planning an itinerary (and getting around to all the most popular photo spots in Rome) takes a bit more legwork than in a smaller city like Florence. That being said, Rome is not difficult to navigate–it simply requires a bit more planning to make sure you see everything you want to without doubling back or spending extra time in transit. … You’re interested in heading south after visiting the city. If Naples, Tivoli, the Amalfi Coast, Mount Vesuvius, or Pompeii are calling your name, Rome is a great jumping off point to reach them. Conversely, Florence could be used as a jumping-off point to reach Emilia-Romagna, Veneto (including Verona and Venice), Milan, and Cinque Terre. To sum up Rome: A trip here will likely focus on majestic monuments, the Vatican, and the history of the Roman Empire. I know that I sang the praises of Tuscan food above (and I meant it! ), but the truth is, all of Italy is home to some of the most incredible cuisine in the world. 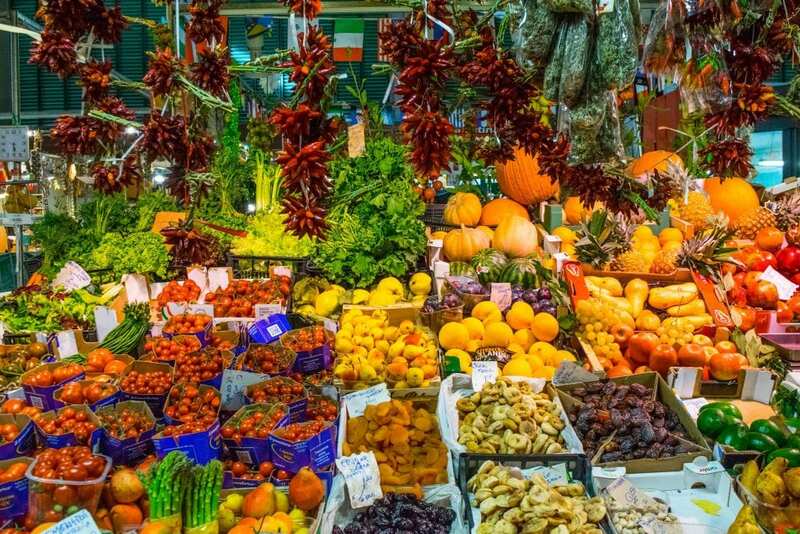 You will have to dig a little harder in Rome to find tasty restaurants and lower prices, but you’ll be in for a culinary treat in both cities as long as you plan ahead. Whether we’re talking about ancient architecture like the Pantheon, Renaissance architecture like Florence’s Duomo, or simply the thousands of unnamed, beautiful buildings that line the streets of both cities, it is a feast for the eyes to wander the streets of either Florence or Rome. Like Italian food, Italian wine is the stuff of legends. While Florence (and Tuscany in general) is your best bet if you’re wanting to head directly to a vineyard for a wine tasting, both Florence and Rome are stuffed to the gills with bars and restaurants hoping to entice you to explore Italian wines. Whether you’re looking for a long, in-depth tasting or simply a tasty glass with dinner, wine isn’t hard to find in either Rome or Florence. … Experiencing history that you likely learned about in school in an up-close-and-personal way. 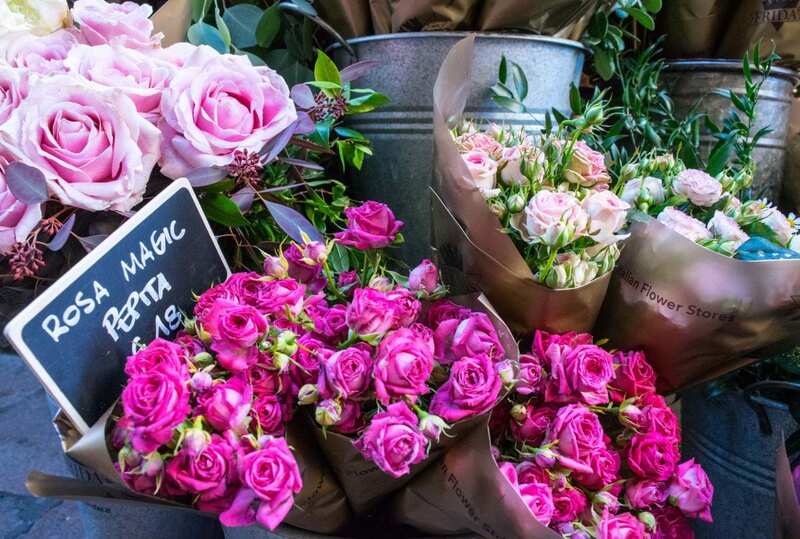 There is something magical about seeing sites that you have heard about your whole life in person–and both Rome and Florence offer that experience in spades. Whether it’s the art, the churches, the archeological sites, or simply the streets themselves, Florence and Rome are both iconic, world-renowned cities that are exciting and often overwhelming to visit for the first (or fourth) time. Technically, Rome and Florence are only an hour and a half apart by train (if you buy the more expensive fast-train tickets–the standard regional train takes 3.5 to 4 hours), but we wouldn’t recommend taking a day trip between them unless you just absolutely cannot help yourself. 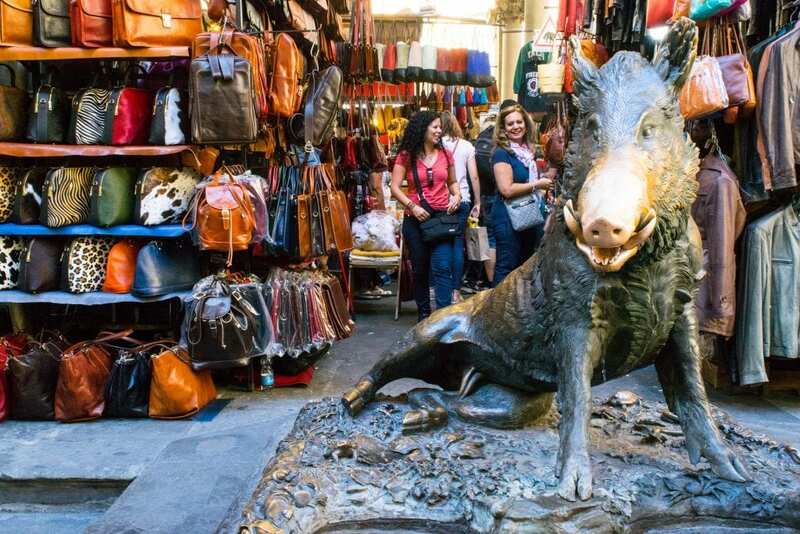 Both cities have so much to offer that if you’re only looking at a day trip, odds are you’re going to be better served by digging deeper into the city or surrounding region that you are in, rather than hurrying through another destination. If you’re absolutely determined to take a day trip between the two, day tripping to Florence from Rome is much more feasible than the other way around. There is no wrong answer when choosing Florence or Rome to add to your Italy itinerary. If you absolutely must choose between the two, we would recommend Florence if you are interested in smaller, walkable cities and accessible countryside on your trip, and Rome if you’re looking for a large, majestic city–what other kind of experience could Rome offer, after all, after being the seat of an empire? Personally, we love both cities for very different reasons and will continue to visit them both again and again. — The easiest way to keep your belongings safe in your hotel room and to give you peace of mind on the road? A Pacsafe! We use this all over the world to store our electronics. Long Pants or Skirt — Churches in Italy have strict dress codes, and both Florence and Rome will likely include visits to several of them. Be sure to wear long pants or a skirt that goes below your knees–and yes, that goes for guys, too. No shorts! Scarf — If you’re visiting Florence or Rome in the summer and are female, it’s likely you’ll be wearing a tank top or off-the-shoulder top. Be sure to throw a scarf in your day bag for those church trips (or simply buy a pretty one in Italy!). — Don’t get stuck buying overpriced water when you’re out and about: save money and avoid putting more plastic on the Earth by carrying a reusable water bottle with you on the go. I have to say, that of the two, I’m more into Florence. That’s simply because I always find Rome too nuts, and when you’re from London, you want a little peace. Florence is busy don’t get me wrong, but there are plenty of side streets and little hideaways to visit. I also spend a lot of time in Veneto, and Florence is only 2 hours drive away, which may have something to do with my bias! When it comes to this debate, I think we all have our biases! 😉 But yes, Florence’s quiet side streets are so dreamy. sure your post will help a lot of people make their choice wisely! When it comes to this tricky debate, I’d have to lean more towards the side of Florence. While I would never pass up a trip to Rome, I find Florence to be uniquely charming and inviting. Plus, who could pass up Tuscan cuisine? Too good! Right? Tuscan cuisine is a paradise unto itself. The walkability is addicting! We loved barely using motorized transportation during our month in Florence. We visited both when we went to Italy. However, I have to confess that we preferred Florence to Rome. While Rome perhaps had a lot more to see, given the overabundance of great churches and museums, we found Firenze to be much more experiential, and we are suckers for new experiences! You’re not alone in that opinion! I love seeing the breakdown of what everyone thinks–almost everyone has a preference, it seems! This is a good summary of the differences between Florence and Rome. I love both and couldn’t choose between them! But I would pick the food in Florence over the food in Rome just because it seemed like there were more bad tourist places in Rome. The art and history is amazing in both places! Interesting! There’s definitely plenty of tourist trap restaurants to be avoided, that’s for sure. What an architectural beauty!! I love the way you have categorized the cities based on what a traveller seeks. For me, it has to be the food. Tuscan food is amazing and I must head to both Florence and Rome, for some wine and dine to remember. Greatly organized and well-written article. I loved how you broke it down by interests. I can’t speak for Florence but can for Rome seeing as my family is from there. Great tips here. It’s obvious you travel right. I would choose Florence over Rome only for my love for Tuscany. I have been dreaming to visit Tuscany from ages and I would not let this option go if given an opportunity. Those breathtaking landscapes, wine, breads and the pastas, I can go on and on for it. I must tell you that the pictures are absolutely inviting. Tuscany is quite addicting! We’re planning on making our third trip to the region this summer, I don’t think it’s ever possible to get enough of it.